Scientists love to categorize things, especially those who specialize in fossils. They enjoy the tedious process of classifying fossils according to their designated species. Paleontologists with amateur fossil hunters are continuously discovering new reserves – each of them is named and classified. However, paleontologists have never officially assigned one classification to “strange” fossils. What makes a fossil bizarre? For some, it would depend on where and how it was discovered and the story it makes about the prehistoric past. While for others, strange fossils are those that look unimaginable and unfamiliar. Well, can you consider this picture strange? For that, here are the 5 strangest fossils ever found. Can you imagine that they once roamed the earth? There were four paleontologists who discovered this strange fossil, which included two from the Simon Fraser University. The gigantic ant fossil has showed how the events of global warming affected life distribution around 50 million years that passed. The newly found gigantic ant fossil was named Titanomyrma lubei. It was believed that this winged giant ant lived in the Eocene Epoch and is already about 50 million years of age. Its body sized up to 5 centimeters long, which can be compared to a hummingbird. Discovered in Madagascar, the 70 million-year old giant frog fossil sized like a beach ball. The fossil was called by scientists, Beelzebufo or the devil frog. The enormous frog fossil weighed about 4.5 kilograms and with a height of 41 centimeters. 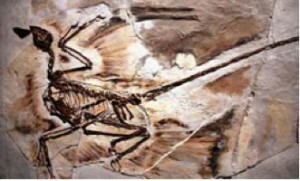 In 2011, paleontologist from University of Rhode Island, David Fastovsky discovered in Mongolia a nest of fossil remains from 15 juvenile baby dinosaurs, which were then classified as Protoceratops andrewsi dinosaur species. This is the first nest of the dinosaur specie ever found. The Megalodon shark was considered to be the largest predator to have lived on earth. The jaw of the shark took 20 years to be reconstructed and it measured almost 9 feet tall and 11 feet across – the biggest ever assembled. 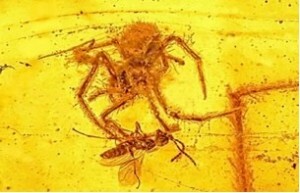 This is the first and only spider attack fossil ever discovered and caught in amber. This spider existed in the Hukawng Valley in Myanmar during the Early Cretaceous period, around 97 to 110 million years ago – almost definitely with dinosaurs roving just nearby. This strange discovery was preserved with remarkable detail as these fossils are considered to be rare.